The Mini Wilson ™ Version 3 is now here and in stock! It now has a longer recording time and an improved battery. The Wilson™ Version 8 is here and in stock now! We have now made the buttons 3x as large as our previous versions so it is much easier to use. 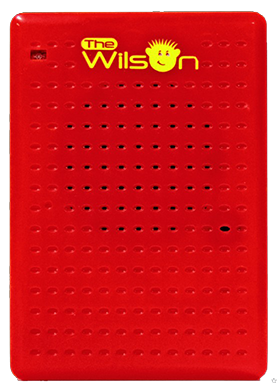 The Wilson™ is cutting edge digital recording technology we invented and hold the patent. Our innovative products are designed with the visually impaired in mind but is state-of-the-art digital recording technology available to everyone at an incredible value. 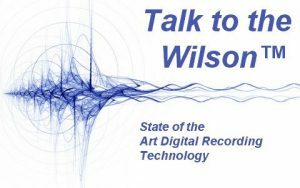 With the Wilson™ digital technology, you can record crystal clear messages and easily play them back. Please click here to hear the Wilson now. Your personal digital voice recorder. Simple to use! Makes a great gift! 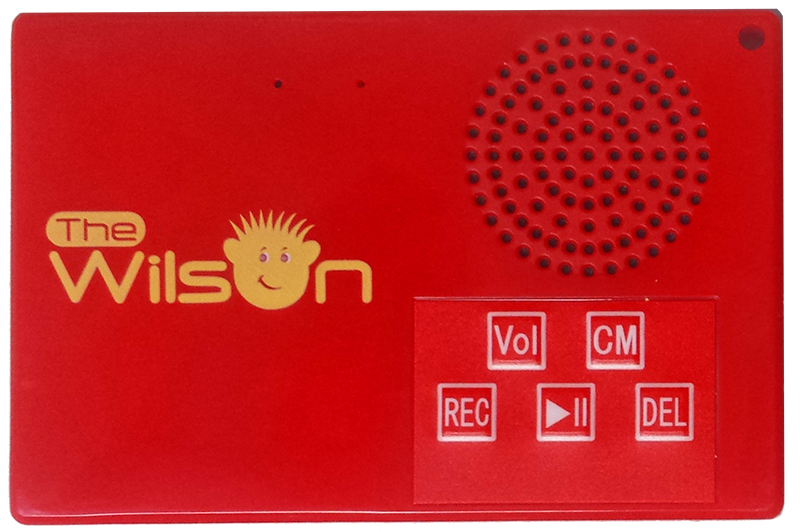 The Mini Wilson™ is a state-of-the-art personal digital voice recorder that is simple to use, feature rich and made from high-quality components with a built-in Li-ion rechargeable battery. 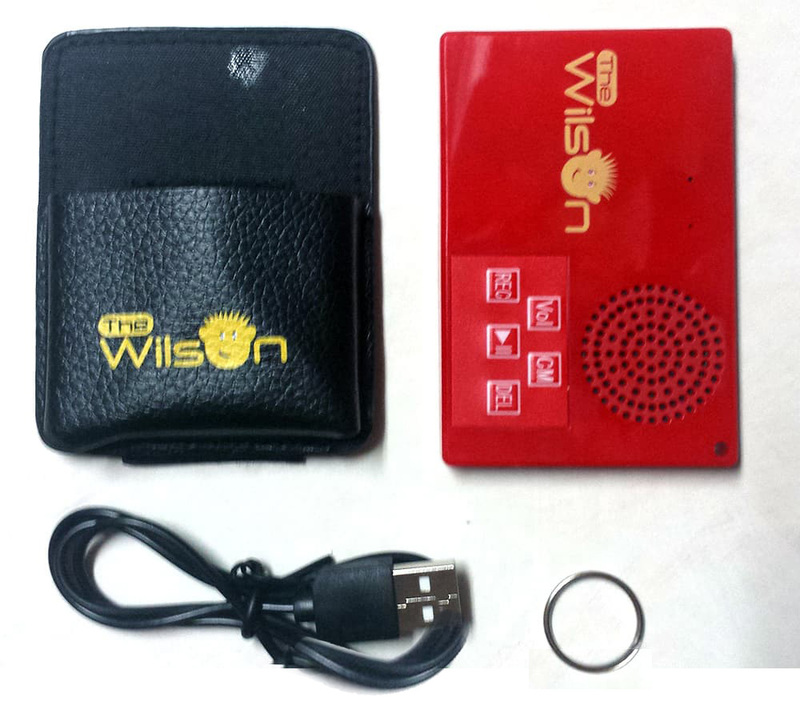 The mini Wilson(TM) rechargeable recorder is a digital voice recorder which resembles a credit card. It can be attached to a keychain and carried comfortably in your pocket or purse. 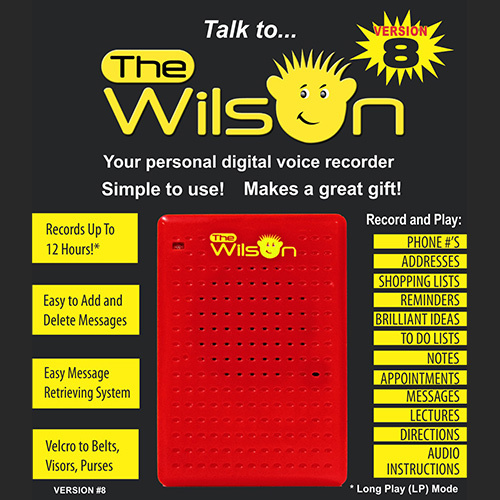 The Wilson™ is a state-of-the-art digital voice recorder that is simple to use, feature rich and made from high-quality components. Handy case with Velcro strap. New reverse & forward message count. Records up to 12 hours! Easy to add and delete messages. Clips to belts, visors and purses.